Chanel makeup is the ultimate in sophistication. Their colour cosmetics and limited-editions are lusted after by every makeup maven, but I get most excited by their complexion products. Like Marmite, people seem to have a very divided opinion of the Soleil Tan De Chanel Bronzing Base, either loving or hating it. For me, it's a staple, summer product and, seeing as I just bought a fresh pot, I thought I'd share my love for it. Are you ready for this? Officially, it's full title is the Chanel Soleil Tan De Chanel Bronze Universel Embellisseur Effet Hale Bronzing Makeup Base. What a mouthful! Essentially, it's a cream bronzer. Described as a makeup base, you could be fooled into thinking it's a primer to be used all over the face, strictly before foundation, which is not the case. Unless you're partial to a one-dimensional look, with a definite 'tide mark' that suddenly stops at the jaw-line, of course. No? 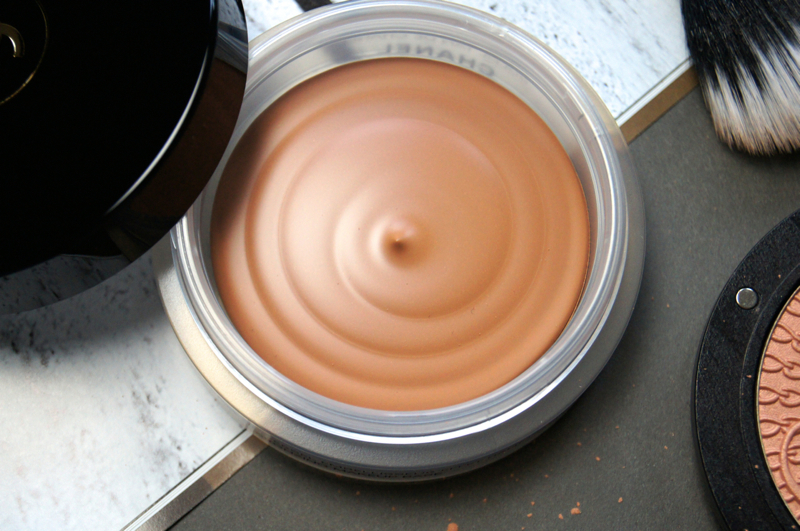 It actually works well in so many ways: used alone, under foundation or over the top. Caught short without fake tan and need a quick-fix? A light layer buffed in with a brush can work wonders on pale limbs and the décolletage. Ignoring the fact that you're greeted with something that resembles a gift from your dog, on opening a new pot, the product is pretty special. At one time, this was really the only cream bronzer on the commercial market and, although many, other brands have now jumped on the bandwagon, none have the same, unique consistency. Chanel have found the perfect balance with the formula. Having a cream-gel texture, the bronzer is so smooth and glides on to the skin effortlessly, with either fingers or a brush. As it contains silicones, it's easy to understand why this base looks and feels so smooth on the skin. 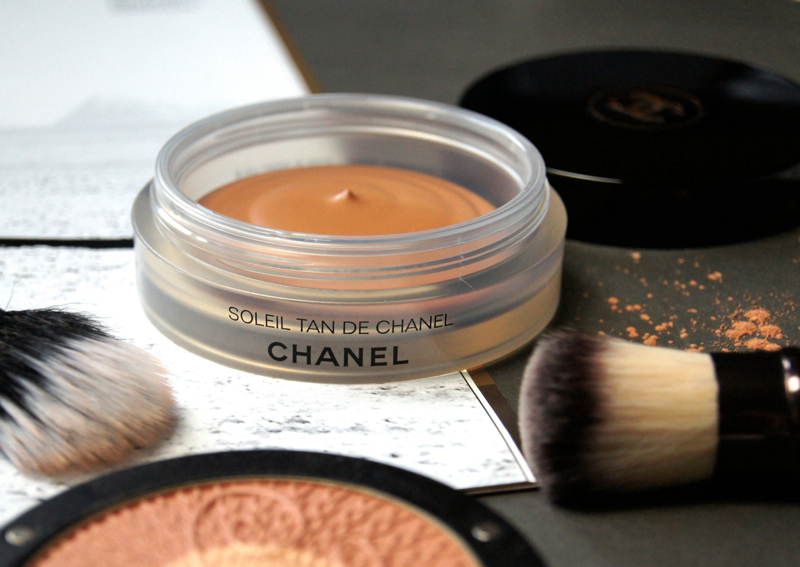 Usually silicones make products feel heavy and suffocating, but that is totally not the case with Soleil Tan De Chanel. It feels a bit like a solid mousse, as it's so lightweight and not too wet. Suiting all skin-types, there's no greasy residue left behind on the skin, but it doesn't feel drying, either. Skin is left looking and feeling velvety-soft, with an almost airbrushed finish. Although it appears to be completely matte, there is the faintest amount of golden shimmer in the cream, but it's virtually undetectable on the skin. That allows you to either sculpt the face to your heart's content and carve out some sharp cheekbones, or to simply sweep it across the high-points of the face to ramp up that sun-kissed glow. Application is totally mess-free and pretty much foolproof. The cream is build-able and can be sheered out for subtle definition and just a hint of colour, or layered for some seriously strong contouring. No matter how much you apply and layer, it doesn't cake or split. If I fancy going all-out, I sometimes use this product first, before applying a powder bronzer over the top. Personally, I prefer to apply it with either a duo-fibre, stippling brush for a lighter finish, or a buffing brush. Avoid using a brush which sheds easily, though, as the hairs can easily get stuck in the gel if applying directly from the tub. Ideal during Summer, it gives much more of a natural result, compared to a powder product, and doesn't give the game away in the unforgiving sunshine. The only downfall of this base, and the reason why some people struggle with it, is that it's only available in one shade. 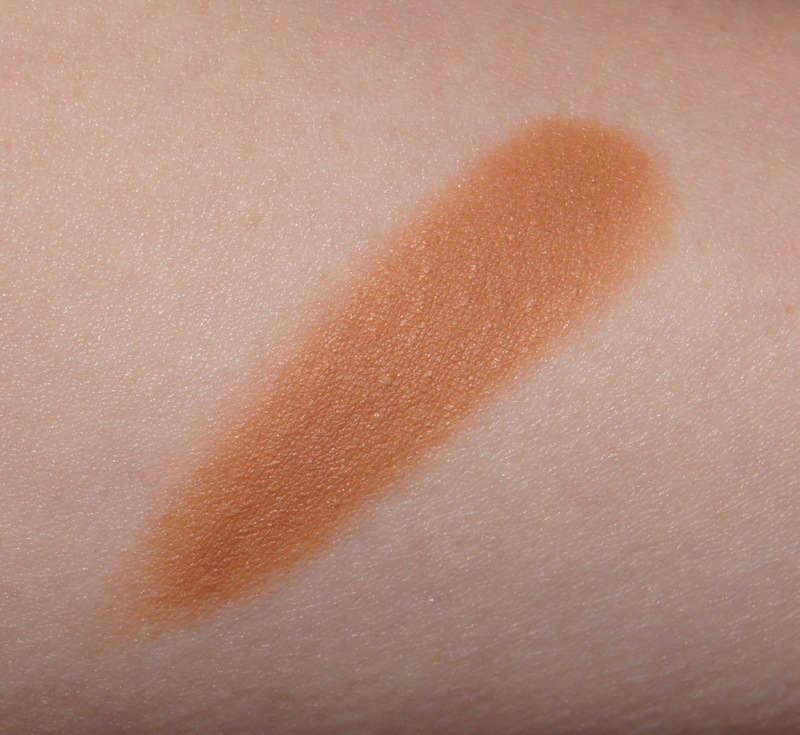 Having a warm undertone, it can lean slightly orange on pale skins. Saying that, I've worn this all year round and my complexion is rather fair, especially in winter. To make it work when I'm at my most ghostly, I tend to apply this bronzer before my foundation, so that it blends seamlessly and isn't quite as strong. That way, I still get the gorgeous finish, without any harsh streaks or an oompah-loompah effect. Surprisingly, this product is just as long-lasting as powder formulas, on my skin. Bear in mind that my skin-type is normal to dry and most makeup lasts well on me, but as the formula isn't too liquid or slippery (a technical term, I know), I imagine it would wear well on the majority of people. Even if I get a little sweaty in the summer, it doesn't start to melt off my face or go patchy. One important thing to note, is that it has that classic, apricot scent to it that Chanel is known for, which forever reminds me of the now-discontinued, Pro Lumiere foundation. Fortunately, this bronzer has never caused my skin to break out or have any issues, but if your skin is sensitive to fragrance, you may want to try it before you buy it, or avoid it altogether. Sitting on your dressing table, the jar looks so chic. Realistically, though, it's a pain to travel with, purely because of how bulky it is. One good thing about the packaging is that it's plastic rather than glass, so it isn't heavily weighted, like their foundation bottles for example. My first pot of this lasted for well over a year so although £32 for 30g may seem like a lot to spend, you do get your money's worth. With many of my powder bronzers, as soon as I hit pan after around six months, the remaining product crumbles and has to be thrown out, which is something I never have to worry about with this cream formula. Usually, cream products have a tendency to dry out, but Chanel provide you with a plastic stopper which prevents the air reaching the product. Ensuring you screw the lid on properly after each use, it should stay nice and creamy until it runs out. 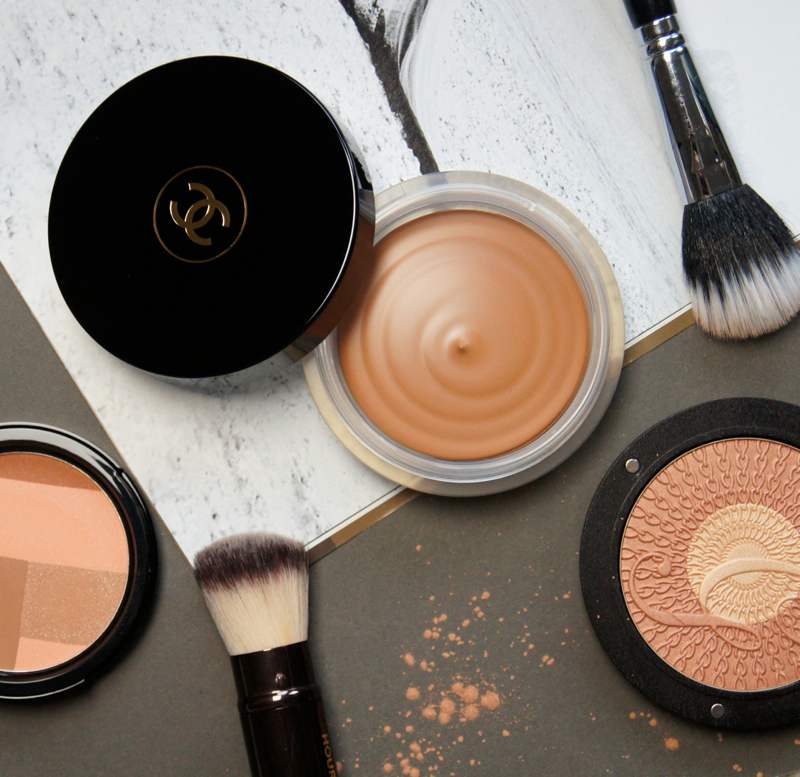 Have you tried Chanel's Bronzing Makeup Base? I love how it doesn't cake on, that's my biggest pet peeve! Ugh, I love Chanel makeup! It's just a shame that it's so pricey :P I do think that I would be among those that love the Soleil Tan de Chanel though; thanks for sharing!